Poets House’s mission is to be a place for poetry for everyone—emerging and established poets, educators, school children, scholars, tourists and anyone interested in poetry. We depend upon our generous donors—at every level—to help us give this gift of an extraordinary place for poetry to others. 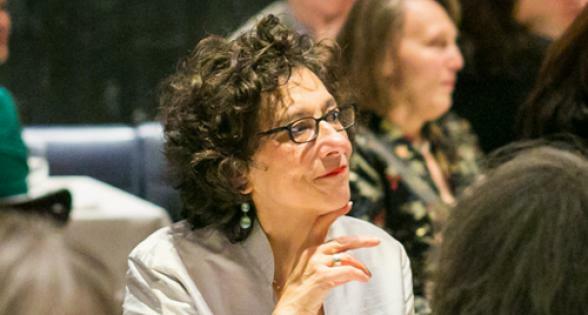 Our donors help us to protect our collection; support our educational programs; be a resource for reference questions; continue to welcome everyone into our space free of charge; and keep poetry as a written art form alive and well. Every contribution, large or small, makes a difference to the life of Poets House. We invite you to join us for any of the special events planned each year to benefit Poets House. In addition to the annual Poetry Walk Across the Brooklyn Bridge, we offer a variety of occasions to enjoy great poetry and the companionship of poets and poetry supporters. Whether it’s an exquisite dinner, a specially curated wine tasting, a film screening, or something else—your experience will be a memorable one, and your ticket purchase will help support Poets House. By making unrestricted gifts to Poets House at any time of year, you can help us carry out our exciting programs, offer no-cost programs to children and families, maintain our library and support our overall operations. Contributions of more than $1,000 are acknowledged in our print materials. Contributions in all amounts are welcome and provide important, direct support to annual program costs. Since a gift of appreciated securities generally avoids capital gains taxes, this type of gift may have a lower after-tax cost to you than an equivalent gift of cash. Gifts of stock or securities can help you maximize your philanthropic giving while minimizing taxes on capital gains. By making a planned gift to Poets House—such as a bequest of real estate or assets—you can leave an enduring legacy while ensuring that we continue to serve future generations of writers. Donors who remember Poets House in charitable bequests are recognized as Sustaining Members. Please get in touch with Christina Lem via email or phone (212.431.7920 ext. 2835) if you are interested in contributing to Poets House in one of these ways. We thank you for your support!